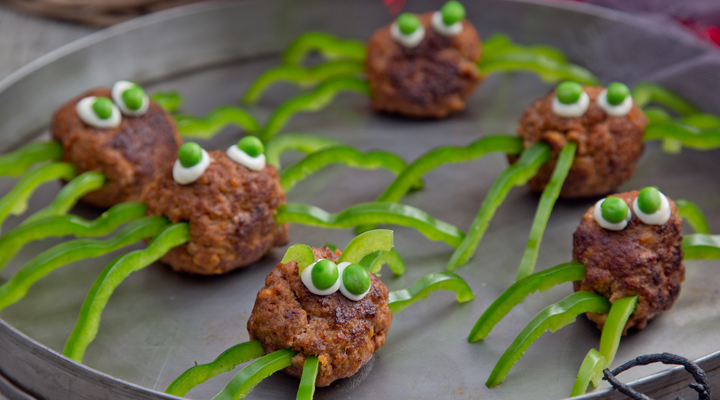 These spooky meatballs are quick to prepare and kids will love them. *This recipe makes 12 meatballs. 1. Place the minced beef, breadcrumbs, egg, paprika and a pinch of salt and pepper in a bowl and mix together until well combined. Divide into 12 balls. 2. Warm the oil in a pan set over a medium heat. Add the meatballs and cook for 6 minutes on each side, until cooked through. 3. Using a toothpick, make 8 holes in each meatball (4 on each side). Put a pepper strip into each hole to look like a spider leg. For the eyes, dab on two dots of mayonnaise and stick on two peas.